When she defected from Czechoslovakia to the United States in 1975, she had one goal – to be the best women’s tennis player in the world. With her legendary determination, talent and hard work, Martina achieved her goal. Her persistent pursuit of perfection garnered her the title of “Athlete of the Year” several times, as well as “Athlete of the Decade” for the 1980s. Martina now competes on the Legends Tennis Tour and in exhibitions around the world. Her Wimbledon commentary on HBO has provided the program with an authoritative view of the sport. Also a successful author, she recently published her third suspense novel, Killer Instinct, co-written with Liz Nickles. In addition to sharing her secrets on the keys to winning, Martina Navratilova remains an influential advocate for many causes, speaking to groups concerned with women’s issues, gay rights, children’s causes, animal welfare and the environment. Do you want to hire Martina Navratilova? Directly request a quote. In 48 hours we can send you the availability of Martina Navratilova If you would like to book Martina Navratilova, Entertainment Booking Agency is the right place. 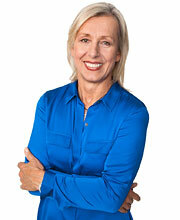 We will offer you the best price and contact the management or we directly contact Martina Navratilova. For corporate appearances or speaking engagements you can contact our agents and the will help you true the process. Tags: hire Martina Navratilova, Martina Navratilova booking, book Martina Navratilova, Martina Navratilova appearances, find more information on booking Martina Navratilova for appearances, Martina Navratilova speaking engagements, Martina Navratilova endorsements/spokesperson, Martina Navratilova appearance fees, Martina Navratilova booking agency contact info, biography of Martina Navratilova, Contact an artist booking talent agent find a speakers bureau that can book Martina Navratilova, speaker booking agency for Martina Navratilova, Martina Navratilova booking agency, Martina Navratilova booking for corporate event. EBA is one of the biggest entertainment booking agencies in the World. We book hundreds of celebrities, artist, athletes and speakers in a year. Important to know is that we are not claiming to be the management of Martina Navratilova. We are not the official agent for Martina Navratilova. Companies from around the globe book these artists and speakers true our company be course we have one of the biggest networks and we always have direct contact with the artist or the management. We help you to find the right celebrities for your corporate of private events. Please contact one of our agents to get free advice and we will help to get the world-famous artist on your party.